Getting ready for my talk on November 12th at Type Americana in Seattle. I’ll be speaking about Linn Boyd Benton at this conference, and Juliet Shen will talk about Morris Fuller Benton. Yesterday I went in to the Cary Collection at RIT to look through my Benton files once more. I found an old xerox copy of a photograph of Boyd Benton (as he was called) at the age of 20, but it didn’t have the sparkle of the photograph we used on the Type Americana website (see below). One of the things I want to discuss in Seattle is how happy Linn Boyd Benton was at his type foundry in Milwaukee. It’s a conjecture on my part, perhaps, but one that has been corroborated by (and in fact suggested to me by) Benton’s great-grandson. Benton invented the punch engraving machine there, in order to more quickly produce fonts of his other new invention, the so-called self-spacing types. He had been working on a different invention, a justifying machine, but when the type he designed for it appeared to be marketable in itself, he switched gears and poured all of his efforts into getting his self-spacing types to market as quickly as possible. It must have been an exciting time. Boyd Benton had a rich, full life in Milwaukee. He was very happily married, and although his son Morris was a sickly child, the family took good care of him and eventually he overcame the after-effects of the scarlet fever and other illnesses he had had as a young boy. Boyd had a fine baritone voice, and sang as a soloist in St. James and St. Paul Episcopal Churches in Milwaukee. He and his wife also belonged to a singing society, and took part in a number of Gilbert and Sullivan and other light operas. I also want to share several anecdotes about Boyd Benton’s childhood at the conference, because they reveal his unusual character. More later . . .
I’m happy to report that my book about Linn Boyd Benton and Morris Fuller Benton is currently in the design phase at the RIT Press. During the course of my most recent research for editing the book, I found an anonymous June 1893 Inland Printer article entitled “L. B. Benton,” which gives a brief summary of his life up to that point and a description of his famous punch cutter. One sentence in the article jumped out at me: “Mr. Benton is, like most men who have accomplished much, modest in discussing his achievements.” This succinct and eloquent description of Benton’s temperament is discussed at some length in my book. Linn Boyd Benton has been called a mechanical genius: “He was one of those people who could see with his hands.” But despite this gift, modesty and humility were perhaps the salient characteristics of both Linn Boyd and his son, Morris Fuller Benton, endearing them to their associates but frustrating more than one writer who was trying to tell their story. After thinking about the Bentons for more than 25 years, I have to say that I’m most impressed by this disposition of theirs. Even from the stories of Linn Boyd Benton’s exceptional childhood, told to me by his granddaughter Caroline Benton Gregg, I got the sense that not only was he a precocious child, but that as a child he was also already beginning to learn humility from his experiences. It may not be considered by many people an essential character trait these days, but St. Augustine wrote that, of all the virtues, the three most important were humility, humility, and humility. Theo Rehak, in conversation with Linn Boyd Benton’s granddaughter Elizabeth Benton Swain, October 1987. The adjustments are such that the operator is enabled to engrave the letter proportionately more extended or condensed, and lighter or heavier in face, than the pattern. All these variations are necessary for the production of a properly graded modern series containing the usual sizes. In fact, on account of the laws of optics, which cannot be gone into here, only one size of a series is cut in absolutely exact proportion to the patterns. The illustration of optical scaling reproduced below was made in 1989 by ATF’s successor, the Kingsley/ATF Type Corporation. At the time, Kingsley/ATF was embarking on a program of digitizing typefaces, including the optical scaling characteristics of the original metal types. Ultimately, the company went bankrupt in the early 1990s, but that’s another story. 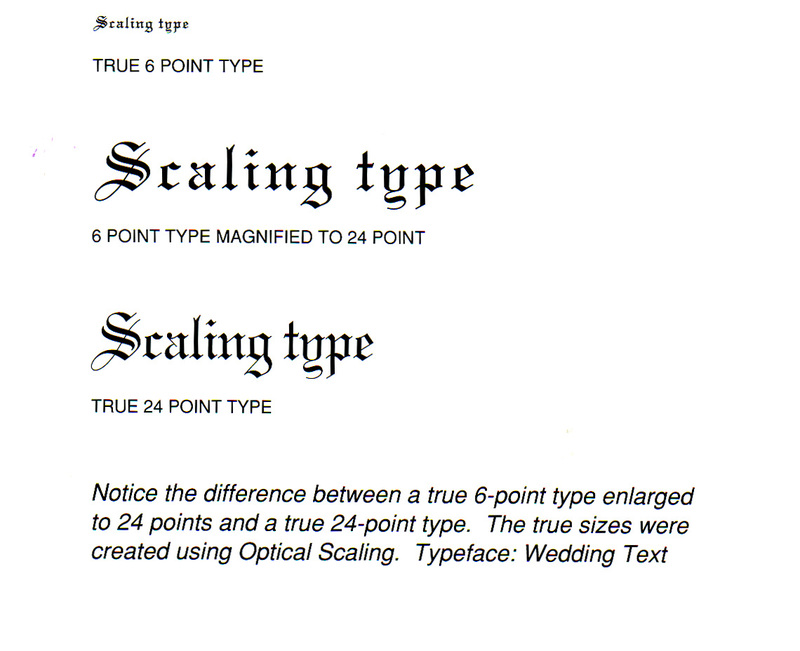 To generate this illustration, Kingsley/ATF photographically enlarged these three sizes of a Wedding Text capital M to a uniform height, so that customers could then easily compare them. Notice that the smaller the size, the more expanded the character. This is necessary simply for legibility, although in the days of metal type mechanical parameters also dictated that smaller sizes be expanded. In addition to the expansion or condensation of the letter, the “set width” of letters in different sizes also had to be adjusted for good optical scaling. The set width is the total amount of horizontal space (width) on a piece of metal type. In order for the eye to be able to read very small type, more white space is needed around each letter, so the type needs to be relatively wide. Kingsley/ATF produced the following illustration, also in 1989, to show its customers this aspect of optical scaling. Because enlarging this sample will perhaps also distort it, I’ve left it at its original size; I apologize for the very small 6-point example. But hopefully it is understandable. I’ve re-typed the Kingsley/ATF caption to this illustration below it in case the original caption is too small to decipher. Why a book about the Bentons? Why would anyone today care about what the Bentons were doing with metal type more than 100 years ago? (These days I’m in the last stages of tweaking my book about them, and I must confess that sometimes this question still haunts me.) But in fact, I’ve found that plenty of people do care, especially those involved with designing or improving digital type. Just the other day a group of digital type designers came to RIT who were pursuing the train of thought begun in a 1912 type legibility study, one that Morris Benton worked on! Type designers today have to deal with what came naturally to the punchcutter when he cut punches by hand. [For anyone new to the subject, the punch was a raised, reversed (“wrong-reading”) image that determined the shape of a letter. It was pounded into a brass bar which became the matrix, with a sunken, right-reading image. The matrix, fixed in a type mold, was then used to cast individual types, again wrong-reading so that they would appear right-reading when printed.] What came naturally to the punchcutter was that letters must be slightly distorted as they become larger or smaller. Today we call this phenomenon optical scaling. Benton understood that slightly distorting the characters as they went up or down in size enabled the basic design to retain its integrity, and so he built this capability into the matrix engraving machine. For example, according to a hand-written ATF reference book, each size of Morris Benton’s Wedding Text was expanded or condensed relative to the pattern for the typeface. Many years later, ATF’s successor, the Kingsley/ATF Type Corp., coined the term “optical scaling” to describe this phenomenon of distorting letters. Charles Bigelow, “On Type: Form, Pattern, & Texture in the Typographic Image,” Fine Print 15, no. 2 (April 1989): 77. Optical scaling is as important today as it ever was. Digital type on a computer screen especially needs to be as legible and comfortable to read as possible. Type designers may ask: Can we systematize optical scaling? Is there an algorithm that we can use to tweak the letters at various sizes for optimum results? This is the same question Benton faced in the early 1880s in Milwaukee as he worked on his pantographic matrix engraving machine. Theo Rehak told me this past February (see my 2/14 and 2/22 posts) that he was sure there was such an algorithm. But, as he explained in Practical Typecasting, Benton’s “Engraving Factor Tables” were lost after he died. Today Rehak is not in the business of producing the full range of sizes of his metal type offerings at the Dale Type Foundry, so he can manage without such an algorithm. When I Google “optical scaling Benton,” there are about 183,000 results in 0.28 seconds; it’s not a dead subject. It seems to me that anyone who admires Morris Benton’s optically scaled typefaces would do well to study how his father’s matrix engraving machine actually distorted the letterforms on the patterns it used for making type in different point sizes. My book would be a very good starting point for such a study. The other day I noticed that I needed to add a footnote to my book about the Bentons, in order to substantiate the fact that Theodore Low De Vinne commissioned the S. D. Warren Paper Company to make a coated paper for his printing press. This came up because I wanted to show several examples of De Vinne’s propensity to act as a catalyst in a new venture or invention. 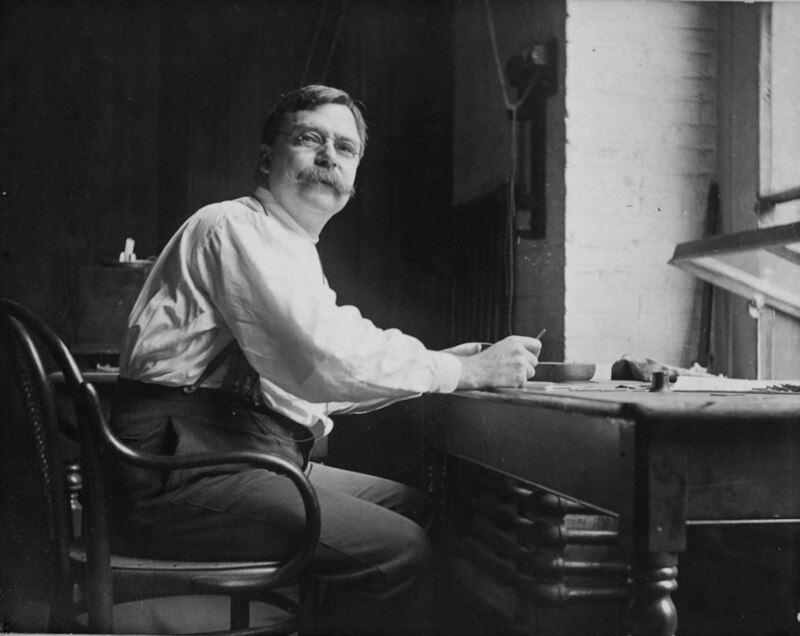 (In about 1893 or 1894 De Vinne asked the American Type Founders Company, and Linn Boyd Benton in particular, to help him design and cut a new typeface for his Century magazine, because he was not satisfied with the types he was using.) I found the reference in Eugene Ettenberg’s Type for Books and Advertising (1947) and added it to the text. But I couldn’t stop thinking about it, so I dug a little deeper. The advent of coated paper in the 1870s came out of one person’s idea, desire, and drive. No doubt it would have been invented later on if De Vinne hadn’t pursued it at that time. But that desire, at that time, unpredictably brought forth something that quickly changed the direction of the paper industry, the printing industry, and even the way we are presented with information today. It reminds me of chaos theory. And it reminds me of the Bentons, too. I go on at some length in my book about the other pantographic engraving machines that were being used to engrave matrices (not very successfully) at the same time that it was dawning on Linn Boyd Benton that the best way to produce his new ‘self-spacing type’ would be with a pantographic machine that cut the models for electrotyping matrices. (This was around 1882.) Ultimately it was Benton who succeeded in building a machine that could do the job easily and well, which in turn (within a matter of just a few years) enabled another machine, the Linotype, to become viable, and to gradually replace most of the foundry type in the world with machine-set type– in effect, eroding the business that Linn Boyd Benton’s machine was invented for! Without Benton’s ambition, Ottmar Mergenthaler’s Linotype machine might have never been successful, and we might have taken a completely different route to where we are today, or to somewhere else we can’t imagine. Mergenthaler too had a lot of desire, an almost manic drive to make something that would work. His story takes up many pages in my book about the Bentons. When I started revising the Benton manuscript a few years ago, I thought that the process would take maybe three to five months. How wrong I was. At the moment I’ve put on the brakes, and now am trying strictly to clean up the loose ends and finish the illustrations. But it is fascinating to think about all the other stories that pop up. I visited the Dale Type Foundry on a Saturday, which was great because no one was working and it was quiet enough to talk to Theo Rehak about the machines. Here were the inventions I had been thinking about for years. I went around the foundry announcing to my son Roger what they were. “Here is a stereotyping set-up; this is a fitting machine; there’s the horizontal Benton engraving machine.” Even though I had visited ATF in 1984 and taken photographs of a row of matrix engravers at that time, last Saturday was completely different. I held a follower in my own hand and traced around the outline of a 16-point Tory Text “H,” designed by Frederic Goudy in 1935. That’s a complicated letter! I held a “quill” assembly (they hold the cutting tools), and then looked at the point of its cutting tool through the foundry’s Louis Pasteur-type measuring microscope from the 1890s (all cast iron). The measuring microscope magnifies the point of a cutting tool so that you can tell whether it needs to be re-ground. “Across the center of the face or lens of the microscope, is arranged a fine scale [ruled] in [increments of] 0.0005 of an inch,” the American Machinist explained. This is about half the thickness of a cigarette paper. A cutting tool looks like a heavy nail under this microscope, and so the cutting tools can easily be gauged by eye—the 0.080-inch tool covers 160 lines on the scale, and the 0.001-inch tool covers two lines. The point of the cutting tool we looked at covered seven lines.